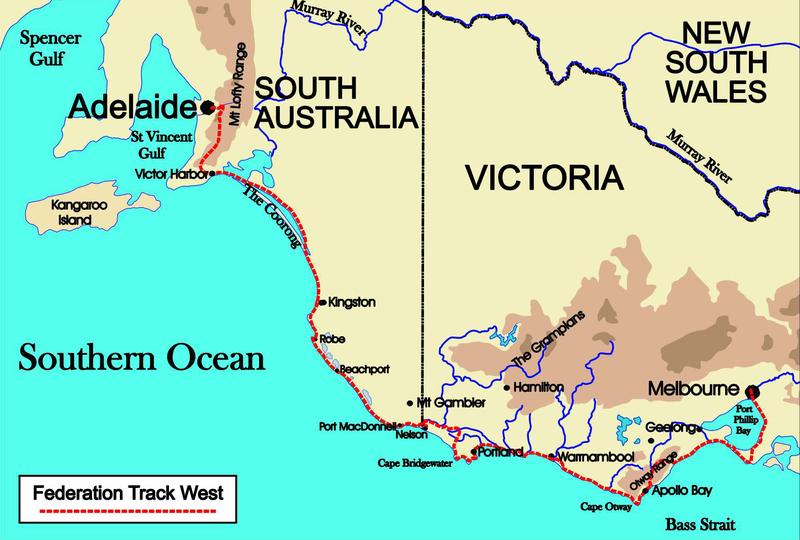 The Great South West Walk has magnificent scenery, delightful walking tracks, sensational river gorges, wonderful camp sites. and easy access. It should be on the “bucket” list of every bushwalker. A stroll past some excellent colonial buildings and a coastal battery takes you a constantly changing panorama of azure sea, rugged cliffs and rolling surf. Every time you round a bend another seascape unfolds and the views across Grant Bay and Nelson Bay are only exceeded by the breathtaking panorama from the highest cliffs in Victoria across the flooded caldera of Bridgewater Bay. The cliff top walk from Cape Bridgewater to Cape Duquesne is a constantly unfolding vista of surf, cliff and sky. Beyond Cape Duquesne, the immensity of Discovery Bay unfolds with its endless beach, high dunes and huge surf while in the distance the blue jewels of Bridgewater Lakes appear back-dropped by conical Mt Richmond. The lakes are alive with birdlife and wildflowers in spring and beyond the lakes the track gradually climbs grassy tracks and forest fire trails to the top of Mt Richmond. At the northern boundary of Mt Richmond National Park the Federation Track cuts across country on quiet back roads to link up again with the Great South West Walk in Cobboboonee National Park. This soft, grassy path, sprinkled with wildflowers, winds through open Stringybark forests that form a constantly changing tapestry of with a chorus of birdcalls and the wind wafting softly through the trees. 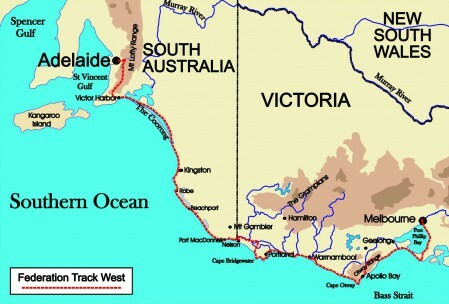 This forest meander ends at Jones Ridge where a huge panorama opens up to the south-west across the lower Glenelg River with its chequerboard of dark green pine plantations, sage-green eucalypt forests, gold and green sand dunes and the indigo blue of Discovery Bay. The Walk then drops down to the mysterious Ink Pot before meeting the glorious Glenelg for the first time. This river runs broad and deep for seventy kilometres from Dartmouth to Nelson and after so many dry creeks it is a delight to the eyes and ears. Beyond Pritchards, a limestone gorge gradually rises on each side of the river. A constant succession of river views appears each one more delightful than the last as you follow the river in all its moods; early morning with the mist rising from the water to veil the cliffs and trees in a gossamer magic; mid-day with the light glancing like lasers from the wind-ruffled surface; evening with the dusk beginning to soften the reflections and the river lying like a glistening snake in the limestone gorge; night-time with the river running softly and silently outside your tent and the waterbirds calling and rustling through the reeds.